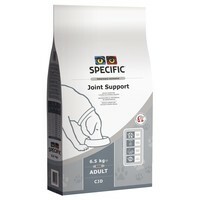 Specific Joint Support CJD Dry Food for Adult Dogs is a complete diet for adult and senior dogs for the support of healthy joint functions. Made with a very moderate energy density for the support of optimal weight management and the maintenance of healthy joints, the diet also contains L-Carnitine to stimulate fat oxidation and preserve lean muscle mass. Specific Joint Support also includes Glucosamine and Chondroitin as natural building blocks of cartilage, and uniquely high levels of Omega-3 fatty acids, EPA and DHA for the support of the overall joint function and mobility. Wheat, Rice, Fish Meal, Powdered Cellulose, Fish Oil, Maize Protein, Eggs, Hydrolysed Poultry Protein, Beet Pulp, Antarctic Krill, Vitamins and Trace Elements, Minerals, Hydrolysed Crustacean Shell (Source of Glucosamine), Psyllium Husk, Borage Oil, Hydrolysed Chicken Cartilage (Source of Chondroitin), L-Carnitine.